Tour Departure times: Every hour from 9:00 - 17:00. When booking this tour you can only choose a portion of time on your select day. The tour company will then select a specific time slot and inform you. We are comparing The Sydney Opera House Tour Prices from leading ticket suppliers and Try to find you Cheap tickets prices on the market. It's one of the world's most recognizable buildings and one of the busiest performing art centres on the planet. Inside you'll find 1,000 rooms and 300 corridors, each delicately designed by Danish architect Jorn Utzon. The building was designed by Jorn Utzon after winning an architecture competition. Construction of the building took over 14 years and cost $102 million to build, 10 years later than expected and 1357% over budget. Your Experience With The Sydney Opera House Tour? Follow your knowledgeable guide, learning about the buildings construction as you go. 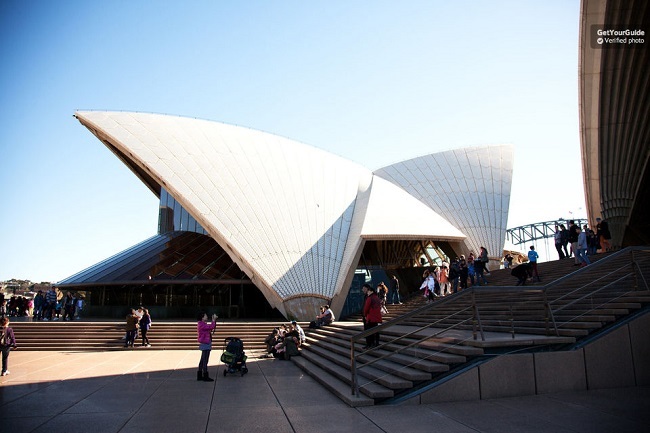 Learn about the architect behind the building, John Utzon. Climb the 200 steps as you continue to explore under the buildings sails. Enjoy access to backstage areas, off limits to the public. Admire the beautiful foyers and delicate vaulted ceiling. Return to the tour starting point and ask your guide any burning questions before you depary. What The Sydney Opera House Tour Includes? The tour involves lots of steps so make sure you're wearing comfortable shoes. Travelers Reviews about The Sydney Opera House Tour? Tickets booked through Get Your Guide are non-refundable. Tickets booked through Viator can be cancelled for a full refund 7 days in advance. The tour meets at the Lower Concourse level of the Sydney Opera House. Sydney Opera House, Bennelong Point, Sydney.